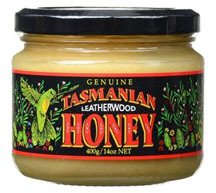 A typical comment about Leatherwood Honey -“This is the best honey I've ever tasted!”. 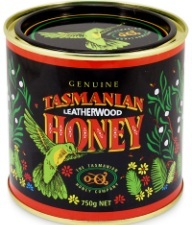 Connoisseurs of fine food around the globe continue to recognise Leatherwood Honey as one of the finest and rarest honey in the world. It is known for its unusual flavour and its complex lingering palate. It has a very unique aroma, some describe it as a spicy type of smell and it would be absolute heaven on toast or in some teas. Luxury in a jar! The healthy vitality contained in this truly natural food, produced as it is from the wilderness forests where no form of pollution exists. The nectar yield of Leatherwood trees is correlated to the age of the tree. Young Leatherwood trees are a poor nectar source. Research has shown that trees under 75 generally don't flower at all and the most prolific flowering trees are those that 175 to 210 years old and trees. The open woodlands and natural pastures of Northern Tasmania yield a rich and varied honey from clover, blackberry, thistle, wildflower. These scents are captured in a mild, subtle and delicate honey with a lingering, fresh flavour that appeals to all tastes. 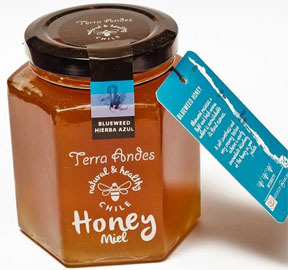 You will find out that Meadow Honey has a superb, very smooth, creamy taste and is easily spread on bread, biscuit, toast. A delicate honey with a sweet, floral flavour. Despite its name, the Christmas Bush generally flowers in the early summer and is fairly rare due its low numbers and inaccessibility. This “Special Reserve” honey is amber in color and tastes of sweet almonds. Unheated and packed raw. 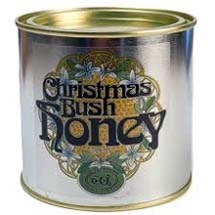 Christmas Bush Honey is soft and mellow with overtones of Marzipan. It is honey with a mild delicate character and a very smooth finish. For 25 years the Tasmanian Honey Company has been collecting honey from a remote island that sits between the Pacific and Indian oceans. This quality honey comes from the pristine wilderness of Tasmania. Lavender is a very special type of honey rarely produced outside of France where it is highly sought after. Delicate and fragrant with a magnificent texture. 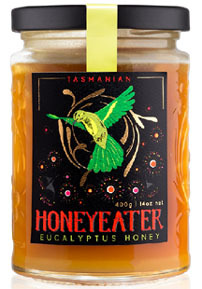 Tasmanian Eucalyptus Honey is creamed and mildly sweet honey that has an herbal flavor with what some describe as a fruity aftertaste. Occasionally, but not always, if you are especially perceptive, you can taste the slightest bit of menthol flavor as an after note. Our Eucalyptus Honey has a surprisingly smooth flavor and deep scent. 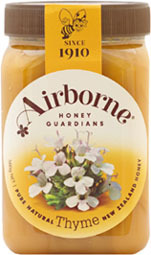 It is recommend using this honey as a protection against colds. 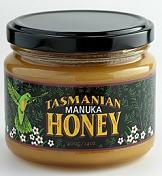 100% pure Tasmanian Manuka Honey. Unheated and unfiltered to keep natural flavors and enzymes intact. Tasmanian Manuka honey has well proven anti-bacterial properties which assist in wound healing as well as nutritional and immune a system stimulatory properties. Beneficial for digestive problems including gastric ulcers. This dark, coffee-colored, elixir is rich with the almond flavor and great taste that Manuka honey fanatics expect. 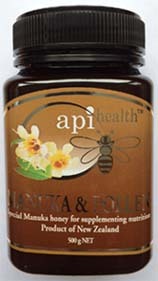 NPA28+ Manuka Honey has been specially tested and selected. It is top quality Manuka Honey. Australia’s Manuka NPA28+ (Non Peroxide Activity) is pure Australian Honey. Tested at independent laboratories (at NZ) and guaranteed to be at least NPA28+ is rich in flavor and it is top of the line. High in minerals and antioxidants this is a very potent antibacterial honey. This active honey is a equivalent to UMF28+ rating and the 1443+MGO. The UMF® rating and all the other trade marked terms use the same (NPA) Non Peroxide Activity score of the honey from the lab certificate. 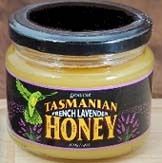 ”Tasmanian Honey” also makes honey in flavors such as ginger and orange peel. All of them are very softly set consistency, which makes them ideal for spreading. Perfect for an unusual gift, perhaps with some tea and English muffins. For ages, Ginger has been a popular European remedy for appetite loss, indigestion and motion sickness. It's effectiveness has been known for 2,000 years. It has been used for temporary relief from common cold and flu symptoms, asthma, water retention, backache, diarrhea, nausea, and vomiting. You'll love the natural sweet and spicy herbal flavor! This honeycomb comes from the wild, pristine wilderness and rainforests of Tasmania and made from the Leatherwood blossom tree by bees. This honeycomb has been laboratory tested and achieved total activity ratings of 20+ for antibacterial properties which originate from hydrogen peroxide that boost specific health benefits for building the immune system and inhibiting bacteria. 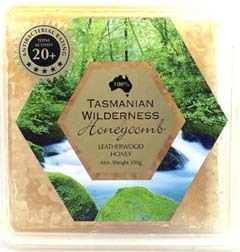 Leatherwood honeycomb is renown for its distinct flavour and can be eaten pure, or in many other ways including but not limited to; dessert, on hot toast or with crackers and cheesed. 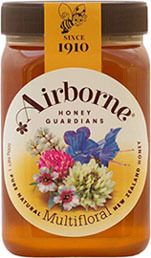 Airborne Honey is New Zealand’s oldest and most trusted honey brand in New Zealand, the world’s first honest, undamaged and traceable (HUT) honey. Clover honey is produced throughout most of New Zealand, but the South Island and Canterbury, Otago and Southland provinces in particular, are the prime areas of quality clover production. Clover honey is light in colour with a delicate floral bouquet and flavour. It is offered in a smooth creamy form. It has a clean, very mild taste. Clover Honey is everybody's favourite. Also commonly known as "Borage", this wild flower covers the hills of the Central South Island in a sea of brilliant blue colour during summer months. The seed, resembling a Viper's head, was once mistakenly used as a treatment for snakebite giving the plant its unusual name. Vipers Bugloss honey has a very delicate flavour. Hint: keep this in the refrigerator and you have a natural chewy snack for kids of all ages. Southern Rata is one of several species of Rata found in New Zealand, but is the one that most regularly produces a honey crop, although even this honey is sometimes in very short supply. Anyone who has seen the Rata flowering in January in the Otira Gorge west of Christchurch cannot forget the sight of this brilliant red carpet covering the mountains. This area produces the purest Rata honey, very white in colour with a subtle, distinctive flavour, mild and rich - but not sweet, considered by many to be the best of New Zealand Honey. Not overly sweet this honey pairs well with white mould cheese such as camembert and brie. Undamaged means Airborne Honey label demonstrates that the honey has not been heat damaged. Honest means that the pollen percentage of the honey is displayed on the jar. Traceable means that every jar of Airborne Honey can be tracked all the way back to the beehive. 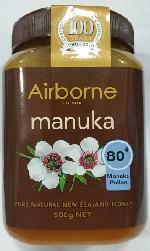 Manuka tree is found throughout New Zealand and often forms extensive areas of bush. The leaves are dotted with oil glands, and when bruised give off a gingery peppery smell. The flowers vary from brilliant white through to rose-pink. The Maori people used Manuka as a medicinal plant, from treating fevers and colds to sedatives. Early European settlers called it the "tea tree." Manuka honey contains a number of natural compounds with strong antibacterial properties. This is a strong flavoured honey, but with a fresh, clean bite. Nodding Thistle Honey: 500g - $19.75(CAD) out of stock! Found extensively throughout New Zealand, Nodding Thistle flowers in late summer with a brilliant large mauve head characteristic of thistles to produce a magnificent light coloured honey with a perfumed floral bouquet and subtle flavour - perfect for those who like a mild honey. A winner of the US Fancy Food Show "Best New Spread". This honey can bee addictive it is so good! It is made to complement your favorite teas, enhance your favorite recipes and great to eat right out of the jar. Light in color, not too sweet. It tastes like nothing else on this planet! In the early morning sunlight, the droplets of nectar glisten like the morning dew, giving the name honeydew. Honeybees gather this nectar to produce honeyde honey. Honeydew comes from the untouched, ancient beech forests that stretch along the base of the Southern Alps. There is no other activity here other than beekeeping, resulting in a honey as pure and natural as you will ever find. A full flavour and aroma,heady, almost pungent, malty. A thick red amber honey and one of our strongest flavoured. Great in marinades to give a richness to barbeques or roasts. 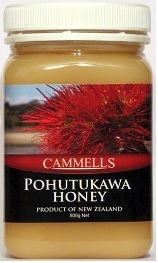 Kamahi is a common tree found in many of New Zealand's rugged native forests, and is an excellent source of honey. The creamy coloured flowers are very attractive to bees and bloom in abundance throughout the Spring producing a light amber honey with a distinctive, full-bodied complexity of flavour preferred by many honey connoisseurs. Kamahi Honey is unique to New Zealand. Musky golden, clean, rich and sweet with a balanced 'buttery' finish. "This is a honey to be cherished." Good for a spread or in cooking where a honey flavour is required in the finished recipe. Tawari (Ixere brexiodes) honey is native to New Zealand. Tawari is a tree growing to a height of 10-15 metres. The 'beaujolais' of honeys, Tawari is best savoured when young. Its origins are the lowland forests of New Zealand's far north where the elegant tree's waxy white flowers, prized by ancient Maori, give the bees a light yellow nectar with a lingering butterscotch flavour. So subtle and mild, it's perfect for topping pancakes, waffles or ice cream. Rewa Rewa Honey: 500g - $16.75(CAD)- OUT OF STOCK! Rewa Rewa or NZ honeysuckle: (Knightia Excelsa) Tree reaching 30 meters is of a tall and tapering form. The trunk is up to 1 meter across. This honey is full-bodied, yet not overly strong and has a beautiful burnished amber hue and delightful smooth malty flavour. A hint of rustic woodsheds pervades the complex aroma. Because the distinctive clustered red flowers of this New Zealand Honey Suckle may not bloom well each year, Rewarewa is a premium variety. In times past the Rewarewa nectar was used to cure sore throats. Rewarewa is a great natural sweetener for hot drinks. Research from Lincoln University has shown that Rewarewa Honey is also high in antioxidants as well as other minerals and trace elements. Both of which are great reasons to enjoy the taste of Rewarewa Honey. With a heritage dating back to the ancient tribes who cultivated the arid, unforgiving soils of the Mediterranean, Thyme continues to flourish today across Central Otago's similarly challenging environment. Its burnt grass colouring so aptly reflects the surrounding landscape. An intensely aromatic honey. Thyme Honey is New Zealand's strongest flavoured honey. It is a member of the mint family, and the aroma and flavour of Thyme honey are herbal, pungent and distinctive enjoyed by the experienced honey connoisseur. Beekeepers' honey extraction plants in the Thyme area have an unmistakable smell to them, long after the Thyme crop has been extracted. Many people in Europe use Thyme Honey as an anti-bacterial medicine. It can be used for sore throat symptoms, some people use it as a cough suppressant medication: mix with brandy or tea and then drink the mixture slowly. Thyme honey is a wonderful gourmet treat. It helps relieve constipation, indigestion, bronchitis, asthenia and loss of appetite. Can be used as cough remedy. Dandelion Honey: 500g - $14.75(CAD) - OUT OF STOCK! Dandelion honey is rare and original. It is harvest in the mountains and the harvest must be done quickly. The colour of honey is yellow like the flower. It has a peculiar taste, very sweet but also with the slight scent of the Dandelion flower. The taste reminds you of your childhood plays on a dandelion field and its high fructose level is a great way to boost energy levels. It is best enjoyed on toast, biscuits, fresh (or cooked) fruits or with soft ripened cheeses and in tea. Dandelion honey is famous for its diuretic qualities. Because many species of New Zealand's diverse, unique flora are concentrated in close proximity to each other, honey produced in these areas cannot be attributed to a particular type of bloom. This pure honey produced from New Zealand’s native bush with some New Zealand’s world famous Manuka honey and the result is a delicious fusion of flavours that has proven to be a favourite by many. Blackcurrant Blossom Honey, 500g - $19.75(CAD)- OUT OF STOCK! From Sheehan Apiaries (South Island of New Zealand). 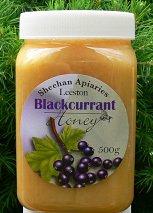 Pure Blackcurrant Honey created from the blossoms of the blackcurrant bushes in South Island of New Zealand. It is pleasantly mild, rich and very smooth with an exquisite hint of blackcurrant finish. Refreshing and spicy honey which contains vitamin C. Blackcurrant Honey is a healthy heavenly sweet. This honey is so GOOD, You won't want to be without it! Enjoy the delicious flavor of Blackcurrant Honey with your sweetheart! Information on this website is not intended to diagnose, treat, cure, or prevent any disease or health condition, nor is it recommended to stop taking prescribed medications. Do not use this information as self-diagnosis or for treating a health problem or disease. Seek medical advice. Manuka Honey is collected from a plant that is unique to New Zealand – Leptospermum Scoparium. The white flowers appear in spring and summer are loved by the honey bees. Manuka flowers have a strong, aromatic fragrance and are full of the nectar which provides this dark, creamy honey. Methylgyloxal has been scientifically proven to be the natural compound. This is the unique activity responsible for the benefits associated with manuka honey. MGO™ 30+ Manuka Honey has a beautiful, full-bodied taste and is guaranteed to contain a minimum of 30mg per kg of methylglyoxal. MGO™ 30+ Manuka Honey is the equivalent of Active 5+ in the older (non-peroxide activity) rating system. Manuka Honey has a beautiful, floral taste and is guaranteed to contain a minimum of 83mg per kg of methylglyoxal. Manuka Honey is a strong native bush (tea tree) honey that has been recently receiving a great deal of interest worldwide. The secret to Manuka Honey has been discovered. Manuka Health’s research partners - Technical University of Dresden - have recently found the active compound in manuka honey - Methylglyoxal - MGO™ Manuka Honey. Methylglyoxal is a compound identified as the active ingredient of Manuka honey, by Professor Thomas Henle, Head of the Institute of Food Chemistry at the Technical University of Dresden. Prof Henle found the higher the Methylglyoxal level, the greater the effect. Most honeys have a concentration of MGO Manuka Honey from 0 to 10mg/kg. 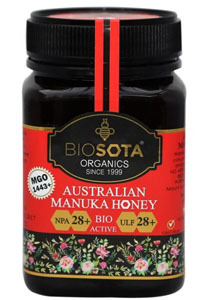 Typically MGO Manuka honey ranges from 100 to over 800mg/kg. Professor Henle states “We always must realize that Methylglyoxal is a NATURAL compound, which has been ingested for decades, and up to now NO negative consequences are known”. 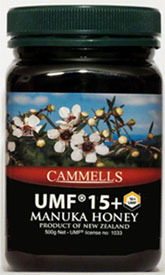 Active Manuka Honey with a UMF rating of 10+ can be taken to help build the immune system. The New Zealand honey industry has registered UMF® (Unique Manuka Factor) as a trade mark to identify Manuka Honey with a high antibacterial component. ApiHealth is licensed member of AMHA (Active Manuka Honey Association). ApiHealth UMF Licence ¹ 1052. 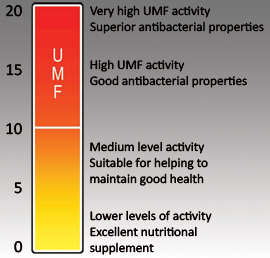 UMF 10+ Active Manuka Honey is a researched product by Dr. Molan and his team at Waikato University in New Zealand. He has shown scientifically that all honey have varying degrees of healing properties. The anti-bacterial activity of honey is based partly on its osmotic effects in that the bacteria that cause infection are unable to survive in honey because they become dehydrated, due to the anti-bacterial agent hydrogen peroxide (produced from an enzyme that bees add to the nectar) - found in honey, being effective against most strains of bacteria. As hydrogen peroxide decomposes, it generates highly reactive free radicals that react and kill bacteria. The peroxide antibacterial activity of other honeys (including ordinary Manuka Honey) was found not to be effective against Helicobacter Pylori. In their research Dr. Molan and his team found a second anti-bacterial component, a unique unidentified non - peroxide activity. This non-peroxide activity is found only in some Manuka Honey. The research team has termed this honey "Active Manuka Honey". In laboratory tests this non-peroxide anti-bacterial activity in Active Manuka Honey is effective against Helicobacter Pylori. The peroxide anti-bacterial activities of other honey are not effective against these bacteria. 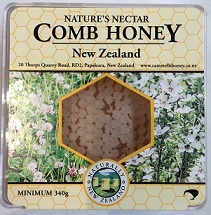 Experience the best of New Zealand Honey i.e. dark & creamy in nature. 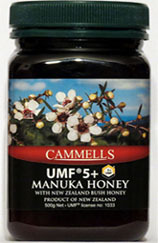 Cammells, a premium Manuka Honey, UMF Certified Manuka Honey, gathered from Manuka flowers in the heart of New Zealand’s unspoilt native forest. Manuka Honey with a UMF rating of 15+ can be taken to help build the immune system or applied topically as an effective antibacterial treatment. Cammells Honey is licensed member of AMHA (Active Manuka Honey Association). Cammells UMF Licence 1033. Manuka Honey has been tested and contains unique activity. This honey is a unique health food with properties that can only be found in Active Manuka Honey. Only Active Manuka Honey has the special non-peroxide (UMF™) activity factor that inhibits Helicobacter Pylori and is effective in relieving stomach ulcer symptoms. For the medicinal uses identified by Dr. P Molan (www.sci.waikato.ac.nz) of the honey Research Unit of the Waikato University. - Apply Active Manuka Honey directly to a wound or ulcer and cover with a porous dressing. Change dressing 3 times daily. - Dr. Molan's research shows the most effective method of treating stomach ulcers is by taking Manuka Honey on an empty stomach. Take 1 teaspoon Active Manuka Honey first thing in the morning, again before lunch and dinner, and before going to bed, on a small piece of bread. The bread helps to keep the Active Manuka Honey in the stomach area longer. Do not drink liquids right after honey intake; the honey needs to stay concentrated to be more effective. - When you feel like you are coming down with a cold and start getting a sore throat, take 1 teaspoon of Active Manuka honey and let it slowly melt in your mouth and slip down the throat. Again, do not drink liquids right after Active Manuka intake. Do this two, three or four times the very first day, as long a you still have a sore throat. - For canker sores, place a 1/4 teaspoon of Active Manuka Honey on the canker sore and let it melt on the sore. Do this 3-4 times per day, for 2-3 days. MGO400+ Manuka Honey has been specially tested and selected. It is top quality Manuka Honey made by Manuka Health. Manuka Honey has been the only food in the world with such a significant Dietary Methylglyoxal content from 20mg/kg to over 800mg/kg. In contrast all other honeys worldwide tested have ranged between only 0-10mg/kg. MGO400+ brings top quality to you in a natural form that is perfectly safe. 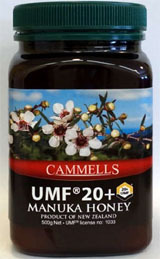 UMF20+ Manuka Honey has been specially tested and selected. It is top quality Manuka Honey which comes from the pristine native forests of New Zealand and it is gaining worldwide recognition for its unique properties. Unpasteurised and minimally processed to ensure the honey delivered to you is just as nature intended - raw and untouched. Active Manuka Honey with a UMF rating of 20+ can be taken to help build the immune system or applied topically as an effective antibacterial treatment. Cammells Honey is licensed member of AMHA (Active Manuka Honey Association). UMF Licence 1033. UMF 20+ Active Manuka Honey is a researched product by Dr. Molan and his team at Waikato University in New Zealand. He has shown scientifically that all honey have varying degrees of healing properties. The anti-bacterial activity of honey is based partly on its osmotic effects in that the bacteria that cause infection are unable to survive in honey because they become dehydrated, due to the anti-bacterial agent hydrogen peroxide (produced from an enzyme that bees add to the nectar) - found in honey, being effective against most strains of bacteria. As hydrogen peroxide decomposes, it generates highly reactive free radicals that react and kill bacteria. The peroxide antibacterial activity of other honeys (including ordinary Manuka Honey) was found not to be effective against Helicobacter Pylori. In their research Dr. Molan and his team found a second anti-bacterial component, a unique unidentified non - peroxide activity. This non-peroxide activity is found only in some Manuka Honey. In laboratory tests this non-peroxide anti-bacterial activity in Manuka Honey is effective against Helicobacter Pylori. The peroxide anti-bacterial activities of other honey are not effective against these bacteria. Manuka honey is a superior treatment for digestive system, colds and wounds. Manuka honey is gathered in New Zealand from Manuka bush, Leptospermum Scoparium, which grows uncultivated throughout the country. Research by Dr. Peter Molan MBE of Waikato University has shown that Manuka honey has very potent anti-bacterial activity and very effective in destroying many stains of bacteria. ApiHealth Trade Mark VENZ 25+ guarantee that every 5 gram of bee venom honey contains a half bee sting. This dosage is safe and has many beneficial properties for body. 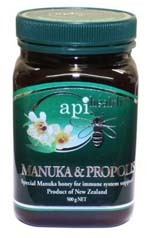 Specially formulated Propolis extract blended with New Zealand Manuka Honey UMF15+. Golden liquid honey in a squeezable container - the perfect combination. 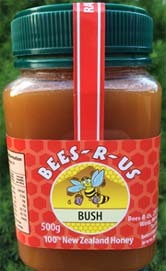 It is stronger flavoured honey with a combination of Manuka and other dark flavoured bush honeys. 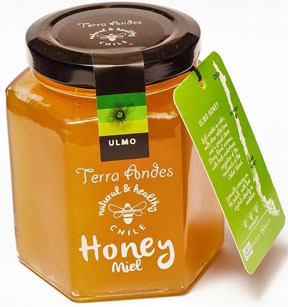 A delicious tasting honey with a pleasant aroma makes it a very popular choice and it is ideal for marinades. New Zealand “Manuka Blend Honey” contains the unique flavor of New Zealand's Manuka Honey. It was blended by bees with other New Zealand wild flowers such as Rewarewa, Kamahi, Pohutukawa to achieve a consistent, pleasant tasting product. 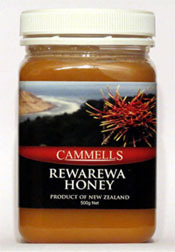 The sweet, herbaceous flavour of Rewarewa, complemented by the deep, earthy taste of Manuka and battery taste of Pohutukawa creates a special appeal for every honey connoisseur. It has the therapeutic properties as Manuka Honey plus the added unique flavour from other plants. When you taste NZ Bush Honey, you will know you are enjoying pure, raw, natural New Zealand honey. A stronger flavour for those with a desire for that nostalgic real honey taste or those wanting that extra flavour in their honey. A range of mixed bush sources including Manuka. This honey is gathered in New Zealand’s beautiful untouched native plants, bushes and flowers, to produce a honey with a stunning taste and floral flavour. This honey was collected from the nectar while pollinating the macadamia orchard. The honey is Raw, Unfiltered, and Unheated - it was extracted and packed straight into the pot. It was liquid and will crystallize. 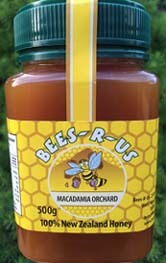 Macadamia Honey has a distinctive complex flavour tasting like malt and caramel and nut with a delicious floral scent. Macadamia Honey is rich in antioxidants so it is delicious to eat and also good for your health. Pohutukawa or New Zealand Christmas Tree (Metrosideros Excelsa). Around Christmas time it smothers itself with masses of brilliant crimson to deep blood-red flowers. The Pohutukawa tree lives to be a thousand years old. The Maori used Pohutukawa bark and nectar in traditional medicines, to cure dysentery, stop bleeding and remedy coughs and colds. Pohutukawa Honey has a pale colour, but quite distinct (buttery) flavour and it is sweet, with a wonderful, subtle, salty taste. 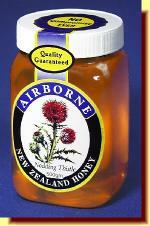 One of the most popular honey among New Zealanders. Sealed in the Honey Comb by the bees, Honey Comb has better retention of flavour and aroma to that of extracted and processed honeys. The fresh bouquet is sealed in. 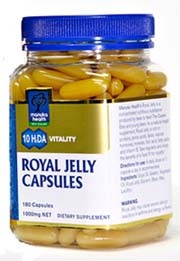 Royal Jelly is the most complex and nutritious food produced by nature, the staple diet of Queen Bee, which lives 50 times longer than workers bees. Helps preserve the youth of the human body. Should be taken before food, 1-2 capsules per day. The benefits include: increases energy, endurance and stamina levels, strengthens the immune system - increasing resistance to disease and reducing stress; helps maintain and enhance hair, nails and skin tone; promotes general feeling of well being; - helps arrest vascular diseases, anemia, arthritis and liver ailments. Propolis is another one of the great products the bees produce that science cannot. Honey New Zealand Propolis Liquid 25% BIO30 is sourced from New Zealand’s clean, green environment. New Zealand BIO30™ propolis is certified to contain at least 30 mg/g of bioflavonoids, the active flavonoid compounds responsible for the biological activity in propolis, and caffeic acids. The high level of bioflavonoids in BIO30™ propolis is thought to be due to the plant sources available to bees in New Zealand’s remote and pristine environment. BIO30™ propolis contains Caffeic Acid Phenethyl Ester (CAPE), a compound which cancer researchers have shown suppresses neurofibromatosis tumours. 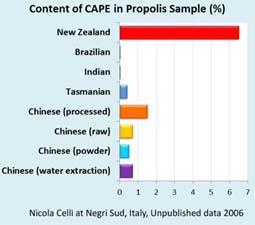 New Zealand propolis is extremely high in the important dihydroflavonoids pinobanksin and pinocembrin, making up 70% of the flavonoid content, compared to levels of less than 10% in propolis from Brazil, Uruguay and China. For more information about New Zealand Propolis: www.bio30.com. New Zealand Active Manuka Honey and Bee Propolis, both renowned for their healing, antibiotic and antiseptic qualities, have been combined with EPO and Calendula oils to enrich and promote skin health. This unique moisturising cream has been developed for sensitive skins and problems such as Eczema, Dermatitis, Psoriasis, Rushes, Acne and dry skin. Scientific testing undertaken by the Cawthron Institute And Crop & Food Research established that East Cape ManukaOil is at least 15 times more effective as Australian Tea Tree Oil against gram-positive bacteria (staphylococcus and streptococcus) including antibiotic resistant strains. General Skin Care Problems, Dermatitis, Eczema, Psoriasis - In the morning and evening: apply Manuka Oil to the affected skin. Manuka Oil penetrates into deeper layers of the skin. Repeat oil application 2-3 times throughout the day, as needed. Nail Fungus - Apply Manuka Oil to the affected place. Repeat oil application 2-3 times throughout the day, as needed. Dandruff, Fleas, Lice - Add 30 drops of Manuka Oil to any shampoo and use daily. You can also rub a few drops of Manuka Oil directly into the scalp or use 2 drops of Manuka Oil in your shampoo in hand prior to washing hair. When you open a jar of Orange Blossom Honey you can smell the delicate scent of orange blossoms. Your first taste of our all-natural golden honey will fill your senses with the aroma and the sweetness of orange blossoms. This honey has exceptional taste and is great used in tea, spreading on breads or biscuits and however you choose to use this honey. This unique and fruity honey is excellent over yogurt and salad dressing. Great all around honey. Therapeutic action: has a calming effect and is recommended for those suffering from anxiety and stress. Mountain Honey is richly flavoured and famous. It is collected in the Pyrénées in the middle of July. A great variety of botanical essences go into its composition, mainly dandelion, brambles, wild thyme, clover, heather and raspberry bush. Its colour is light brown, its flavour, very mild and tasty. The flavor opens with a creamy sweetness and finishes with a pleasant tang that keeps the sweetness in check. This is a good everyday honey, perfect to spread on toast. Honey made from the flowers of wild oak trees is a true rarity, and one taste of this dark honey will let know why it rarely makes it to our shores. It is mild honey and complex in flavor. Smooth in texture, this delicious honey has caramel and molasses notes as well as an aromatic finish without a hint of bitterness. It possesses an agreeable amount of acidity that keeps the sweetness in check and makes for a great finish. Oak Honey is high in oligosaccharides. Oligosaccharides are very good to maintain and promote beneficial bacteria in the gut, especially after treatment with antibiotics. Rosemary honey is light yellow in colour with a pronounced flavour, very pale, almost white, with a faint plant-like scent. Rich and fragrant, it melts beautifully on the tongue, turning creamy and then disappearing in seconds. Herbaceous notes cut the sweetness, revealing layers of true honey and honeycomb flavor far beyond just "sweet". Stimulates hepatic functions, advised also in case of asthma and of digestive difficulties. Has been known since Roman times as a liver cleanser. Heather honey is the gourmet and connoisseur’s choice. It is brown colour with a wonderful, distinctive and aromatic taste.The true aristocrat among honeys, with its distinctive smoky taste and thick texture. Always in short supply. From a culinary appreciation point of view, amongst connoisseurs Heather honey is claimed to be the finest flavour of all. Did you know that Lavender Honey is considered by many honey lovers to be one of the best honey in the world? This is the most elegant of all honey - perfectly perfumed, smooth, rich-flavoured, well balanced and gentle. It has a fresh and slightly acidic taste, reminiscent of lavender in sunshine. According to popular folklore, lavender honey is especially good for those with respiratory conditions or asthma. In modern medicine, lavender is sometimes used as a mild sedative. Once you have opened this jar you will find it practically impossible to resist... Yes, it really is that good! The taste is floral and absolutely delicious! It is produced in June and July in Provence. Famous for the beauty of their fir forests and the purity of their mountains air, the beekeepers of Provence produce a perfect Fir Tree Honey.It has a denser, richer flavour than most floral honeys. You might say it has more "bass notes". In part, that's because the nectar the bees gather doesn't come from flowers at all but from the resin of balsam fir trees, known in France as “sapin.” Fir Tree Honey is dark-brown color and it has powerful flavour. It is useful in cases of bronchitis, flu, colds and asthma. It is known since ancient times for its healing virtues and its anti-insomnia effect. Try it over yogurt and on toast! Acacia Honey is produced during the springtime, mostly in May, when the winter is over and summer is coming to warm up the land. Acacia Honey is clear, a transparent golden liquid that literally shines like a precious stone. Its bouquet is as bright as its color. Its texture and flavor are ethereal, ambrosia-like finishing with a haunting floral note. It is one of the mildest honey in the world. Therapeutic action: it cleanses the liver, regulates the intestine, and is anti-inflammatory for the respiratory system. It is the best choice for diabetics due to its high, but not excessive, fructose content. Obtained from the blossoms of Linden or Basswood trees of several species of Tilia; it is known as Linden or Basswood honey in North America and Lime honey in the UK. Linden Honey has slightly yellow colour, nice lime aroma and rather mild flavour. It crystallizes fast attaining almost white colour. In Europe, it is widely used in the treatment of sore throat and laryngitis. Linden honey mixed with lemon is used for colds, and along with tea is said to help in the treatment of liver and gall bladder, and relieve inflammation of the gastrointestinal tract. The nectar of chestnut blossoms, it is smooth, dark and rich, with the woodsy undertone of chestnut and a bittersweet tinge, the smell is strong and pungent.The flavour is unique, not very sweet and with an almost bitter aftertaste and very persistent, highly appreciated by those who like a strong, less sweet honey. It is true connoisseur's honey, its robust flavour marries well with cheeses and wine. It is excellent for sweetening coffee without altering the flavour and spread on bread and butter at breakfast. Its special properties are beneficial to those suffering from anaemia, fatigue and asthenia. Blossoms from May to June. Sunflower Honey is bright yellow, not very sweet, dry, with an aroma of pollen, slightly herbaceous. It has a lively, pleasant taste, and is often called the traditional honey. Sunflower honey always has a creamy quality and a fine texture, which is easy to spread. Sunflower fields are a real flower paradise for bees, as the sunflower produces a lot more nectar than usual flowers. In folk medicine this type of honey is used for treatment of heart diseases. Delicate light waxy honey is great on crusty rye or whole grain breads. Pine Honey: 1000g - $28.00(CAD)Out of stock! The honey from Greece is considered to be some of the finest honey in the world. 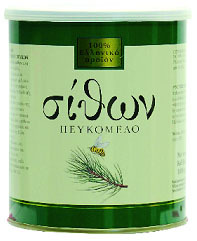 Sithon Greek Pine Forest Honey, 100% pure honey collected in the area of Sithonia in Chalkidiki (Northern Greece). This is an intense, rich honey, and the distinct pine scent distinguishes it from other honey varieties. This unique flavored honey is the one with the most nutrients compared to other types, and that’s because of its highly content in trace elements and mineral salts.The phenomenon of crystallization is seldom observed in pine honey because it is low in sugars. Collected and packaged in Greece. 100% Authentic Cretan Honey from Fragkiadaki family.Thyme, Wild Herbs, and Pine Forest Honey. 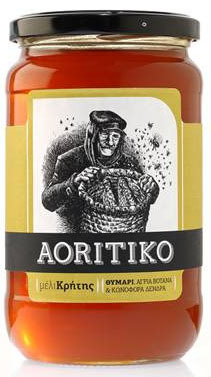 AORITIKO Cretan honey has that unique flavor which makes it so delicious. 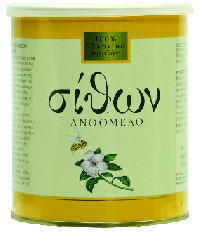 Cretan honey from mostly thyme and wild herbs that grows on the Cretan mountains at an altitude of 1500m. has a delicious unique taste. Low humidity, warm and dry climate gives a unique aroma and texture to this honey. Greeks believed that honey was the food of the God Zeus when he was a baby, as well as the food of the other Gods. Honey was believed to give eternal youth and beauty. The philosopher Democritus (500 B.C.) and who lived until the age of 104, was once asked about his secret to longevity. He responded by saying that the secret lies in ‘coating one’s body with oil externally, and with honey internally’. Wild Flora honey is light in colour and rich in flavour. It is derived from the nectar of different wild flowers in the mountainous regions of Macedonia. It is produced from May to August. Variables such as unlimited summer sun, the biodiversity of the Greek countryside plus the rich variety of Greek flora which includes over 850 species found nowhere else in the world! Aristotle, philosopher and student of Socrates, believed that honey prolonged life. There was “honey therapy” used at the most famed health spa in ancient times , the Asklepieion. It is considered to be the best honey from South America. It comes from the nectar of the native Chilean Ulmo tree blossoms. Ulmo Honey is rich in nutrients and has active properties very similar to the well-known Manuka honey. This is a beautiful honey with notes of jasmine and mint. Enjoy this "super honey" on hot buttered toast, drizzled on pancakes or stirred into oatmeal. Our Ulmo honey is unpasteurized and raw. Blueweed Honey is a yellow gold color with a light clean taste, a floral bouquet and lemon characteristics. It is high in fructose which makes it slow to crystallize. It is delicious in tea or coffee and compliments a strong cheese such as blue or Roquefort. A sweet, floral honey with a syrupy texture, and quite intense flavours. Deep brown in color, with plummy green undertones. Mild and balanced aroma, with the unmistakable glints of wood and forest distinctive of the trees growing in Chile’s Central Valley. Sweetness is pronounced and becomes more intense in the back of the palate. Texture is soft and pulpy, with nearly undetectable crystals. 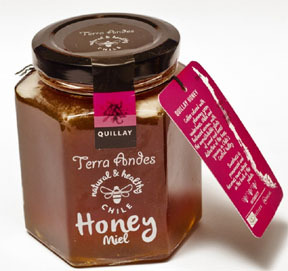 Our Quillay Honey is unpasteurized and raw. 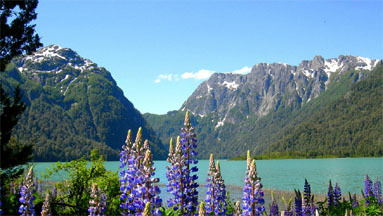 The diverse beauty throughout Chile is a tribute to nature. It is long and narrow framed by the Andes mountains on east, Pacific ocean to the west, volcanoes, glacier-covered mountains and incredibly remote countryside, rainy age-old forests, powerful rivers and crystal lakes. 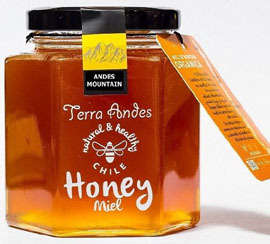 In this land where the earth is a witness to sweet trees and abundant flowers of Terra Andes was born this unique Mountain Honey with the light body and pleasant taste. Our Mountain Honey is unpasteurized and raw. For more information - "Contact Us"
Last Updated: May 30, 2011. © Copyright 2011 Honey World Inc. Com.